School is in session all across America and the same was true for 126 platform tennis players in Lake Forest, Illinois from September 20th and 23rd. Anyone who walked by the platform tennis courts at the Lake Forest Club (LFC) would have sworn they were overhearing a math class. Comments like “96% of all points end with the last person who touches the ball making a mistake”, “the net is divided into thirds” and “the game is based on percentages” echoed from all four courts. The professors were LFC’s Director of Racquet Sports and paddleplayer.com’s managing partner Alex Bancila, LFC’s Racquet Associates Will Colmar and Adam Morgan and yours truly. The four of us were teaching the game of platform tennis, the simplified and high percentage version. People consider the game of Platform complicated, I actually consider it quite simple. I believe that platform tennis is a simple game that people complicate for no reason. Everyone wants to hit a winner or finish the point, most players want to be the hero who hits a great shot. Few people realize that if they are willing to stay out there for one extra shot that they can become the player they dream to be. In other words simplify your game and never be the last person to touch the ball – in my opinion the single most important concept in the game. This became the premise of the platform boot camp that was brought to the Lake Forest Club by paddleplayer.com. Levels at the camp ranged from people who had never stepped on the court before all the way up to series 2 players. The camp consisted of two three hour daily sessions of instruction on a variety of topics. Beginning groups focused on the seven necessary shots in platform tennis while advanced groups were taught about when to give up the net on their own terms on a deep lob, unconventional ways to start the point and many others. Overall, the level of excitement among the participants was contagious. Everyone was walking to their next court chatting about what they had learned on the previous one. The camp took place over four days and included eight sessions. There were people on waiting lists in case someone dropped out of any session. There was one person who took the camp twice so that they could fully comprehend everything being taught. An exhibition on Saturday night consisted of four players all of whom will enter the season ranked in the top 4 in the nation. Alex Bancila, Peter Berka, Dane Schmidgall and myself – a rarity in any tournament match let alone in an exhibition. The four of us played an entertaining three sets of platform tennis in front of a packed LFC Hut – the LFC members are without a doubt some of the most passionate platform tennis players (and fans!) that I have ever seen! Overall the camp was a huge success. People left wanting more and many asked if there would be a follow up camp later in the year. My hat goes off to Alex Bancila for organizing what is arguably the largest preseason boot camp in the history of the sport. 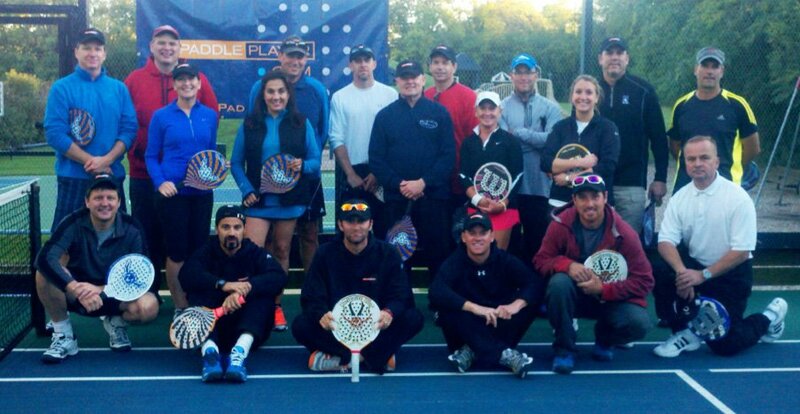 Be on the lookout for a paddleplayer.com camp in your area and learn the simple math behind platform tennis. If you are willing to simplify your game and use the tools our camps give you, I guarantee that you will become a better and smarter player!